When you come into Smooth Rock from the east, don’t be fooled, what you’re seeing is not a one-story IKEA. It’s the local hospital. One tourist guide I picked up said that Smooth Rock was the “perfect stop over and supply center.” Man, those guys really know how to write a tourist brochure. Talk about underselling…Smooth Rock deserves more than that! 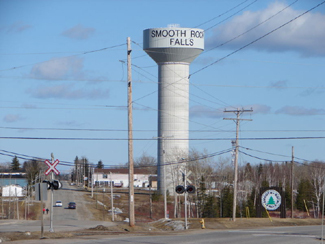 Nestled along the picturesque Mattagami River, Smooth Rock is more than just a town that sounds like a radio station. It was home to Jeffrey Buttle, a recently retired Olympic silver medalist and world champion figure skater; Louise Pitre, a singer who has appeared on Broadway; and JP Parise, a former NHLer who played in the ’72 Summit Series, has coached at the famous Minnesota Shattuck-St Mary’s hockey program, and who is also the father of New Jersey Devils’ forward Zach Parise. Those are three people that should have their own “Welcome to Smooth Rock, the home of…” signs on the way into town. I’ll pledge 50$ toward that. 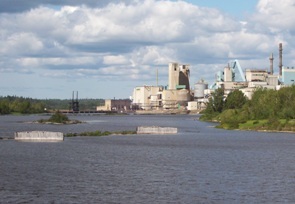 Smooth Rock is a largely francophone community of 1800 centered on the pulp and paper mill. The problem is that “the North’s biggest little town” (their motto, I think) is about to get smaller as the mill shut down indefinitely in July 2006. Smooth Rock is facing an uncertain future after the loss of their major employer. Which is really sad, since it’s a cute town and probably a great place to grow up and to retire. I’ve heard that the town and its residents are trying to start up a community-based venture to restart the now shuttered mill, but I don’t know if they’ve been successful. Smooth Rock doesn’t have a tonne of touristy-type stuff. There’s the Forget Me Not BnB west of the river. There’s also a nine-hole golf course, a nice park on the east side of the river, and there are some fishing opportunities as well. Smooth Rock is good place to stop on the way to Kapuskasing and a place to get gas if you’re heading up to Fraserdale. Northway Restaurant claims they have the “best poutine in the north”, although I’m sure that Poutineland in Timmins gives them a run for their money. Audrey’s has good breakfast in a spartan setting. There’s also Coco’s Chip Stand off the highway. Rue Sixth is the main business section for Smooth Rock. There’s a full-blown LCBO, an Esso, and a Tim-Br Mart. The Moose Motel provides accommodations and SRF’s entry into the “some big weird thing” motif that is all the rage on Highway 11: a statue of a moose. There is no Tim Horton’s or chain stores as far as I have seen. I don’t know if there is a Chinese restaurant, but it’s northern Ontario so there must be one somewhere. Also, don’t be fooled. There are signs advertising the “SRF Centre” on Highway 11 in both directions. It’s not a mall – the “SRF Centre” is a truckstop with some slightly self-aggrandizing tendencies. On an anecdotal bent, the town of Smooth Rock Falls used to plow each resident’s driveway in the winter. I don’t know why that service ended. This entry was posted in The Interior and tagged big weird things, francophone, hockey, pulp and paper by Highway11.ca Editor. Bookmark the permalink. I first laid eyes on Smooth Rock Falls back in 1978. As I looked around the dense bush and listened to everyone I encountered speaking French, this Saskatchewan girl felt lost. Many made me feel welcome and teased me good naturedly about learning to speak French. I still don’t speak it very well but I understand it quite a bit. In Sask where I come from we don’t have blackflies. So imagine my surprise when the little flies I thought were so cute bit me viciously! I didn’t think they were so cute after that. My late husband, Carl Jacques, came from Smooth Rock. This place holds a lot of memories for me and always will. I was born in my Grandfathers house, about 5k west of town. Did all my schooling at Ecole St. Gertrude and the S.R.F.C.S. where I graduated in 1962. Moved to Toronto and College. Lived for a time in Cloutierville, until grade 5. My parents followed work for a couple of years. I came back then to live with my Grandparents, (didn’t like the road life). Smooth Rock Falls… my first memories of consciousness as a child walking across Mom and Dads kitchen floor occurred on third street right across from SRF K-13 school… the place where most of my childhood and teenage years would transform me into who I am now… someone who looks fondly back on the memories. I’m always reminiscing and smiling to myself of the shear innocence and humbleness of my home town… a place where kids could disappear for hours from their parents on adventures in the great outdoors… a place where parents could take their kids to any adventure that their imaginations would allow… fishing hunting,fishing,camping,hockey,curling,skiing,carnival,visiting the retired steam engine in the center of town,coffee at The Grill,Sea Dees Restaurant,coffee at the Northway,hanging out at the Pizzarea,running into family and friends on any given day,Christmas time,New Years, dances, love, friendship, peace and safety… Mom and Dad, I love you and thank you for all you did to mold me into who I am… a person who loves God and loves his fellow man. 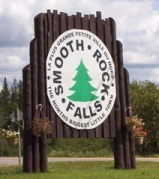 Smooth Rock Falls is my home town and I love telling people I’m from there. I lived in SRF from 1968 to 1974. I was in a foster home at Mr. Prosper Marchand. Did my High School there, hanged around with Nicole Gagnon who sadly passed away this January. I remember quite well the dear & missed Mrs McCafferty whom advised me quite well to try bookkeeping. Also remember Roger, nice guy who cared. I love Smooth Rock Falls! It is the best little place in the world. My friend just bought a tax arrears home there, little blue place, of which the people at the township office were great with me getting to see it and the info….and the two township guys…that showed it to me were wonderful. A piece of heaven! My family lived there July ’64 -Jan. 1, 1968. (we left The Inn 6 days before my 10th birthday). I describe my childhood there as “Who Has Seen the Wind”like. Keith Neve! I remember you- how could I forget the kid who drew with a dull pencil war pictures (tanks?) on paper with his desk lid tilted up because of all the paper/crap stuffed in your desk? Does Pam still have her cast from when she broke her arm? (I hope not!). I waved to police even after we moved but was shocked they didn’t wave back. Sorry the mill closed…my dad worked there, Abitibi did well by him. Wow. Looking at retiring in SRF. Reading your post gave me a friendly chill. My dad was one of the members of The Rythum Kings. The band was made up by, Ozzie Boutilier, Eric Sheppard, Bob and Bill Dubreuil. Based out of Manitouwadge. Great story my friend. i moved to srf in 1972 my father was a welder up until he retired,my mother worked at the inn serving food and drinks everything is slowly dissappering the inn,themill the grill,the theater the french school a top the hill across from the catholic church next it will be the k 13 school then the pool there are no kids to fill the schools anymore and our mayor or should say want a be mayor is not i repeat not doing anything to bring any new investors to out great little town he cannot even get the flag lowered for rememberance i ask he stated he wasnt in town i feel it the mayors responsibleaty to do this he has 6 other council members to do this what a discrace.and a slap in he face of the men and women who fought and gave there lives so we could have better ones.